From July this year, The Really Useful Group has released licences for this new and exciting youth production version of "The Phantom Of The Opera". 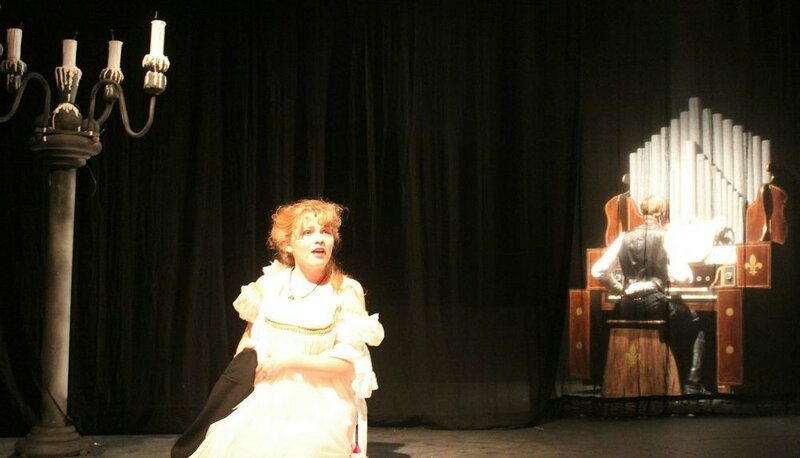 Saffron Walden Theatre Company's Youth Group seized an early opportunity to perform this new work and produced a truly stunning performance. Based on the classic novel by Gaston Leroux, the combination of Andrew Lloyd Webber's haunting and unforgettable music and wonderful lyrics by Charles Hart and Richard Stilgoe, bring to life the story of the legendary masked figure who lived in the catacombs beneath the Paris Opera House during the 1880's. In his passionate desire to nurture a young chorus girl's extraordinary singing talent and create a new opera star, he uses all manner of devious ways at his command to achieve this end and inflicts a reign of terror over both the management and performers. Matthew Chancellor as Director and Martyn Grisdale as MD again achieved the phenomenally high standard they had set last year with "Sweeney Todd". Every one of the strong and talented young cast gave performances that belied their age and left me completely spell-bound. I could not fault their attack and delivery of what is a very complex and demanding score and the vocal achievement was proof of the hard work that the cast and production team had so obviously put in during rehearsals. The only glitch during the entire performance was an occasional imbalance of the sound during some of the vocal numbers. 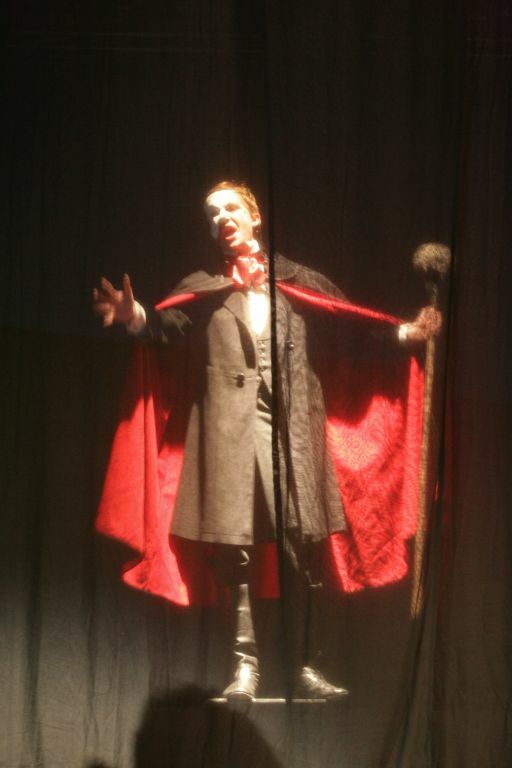 Ed Chancellor as the Phantom was mesmerizing; his talent for showing both the vulnerable and evil side of the character was exceptional. 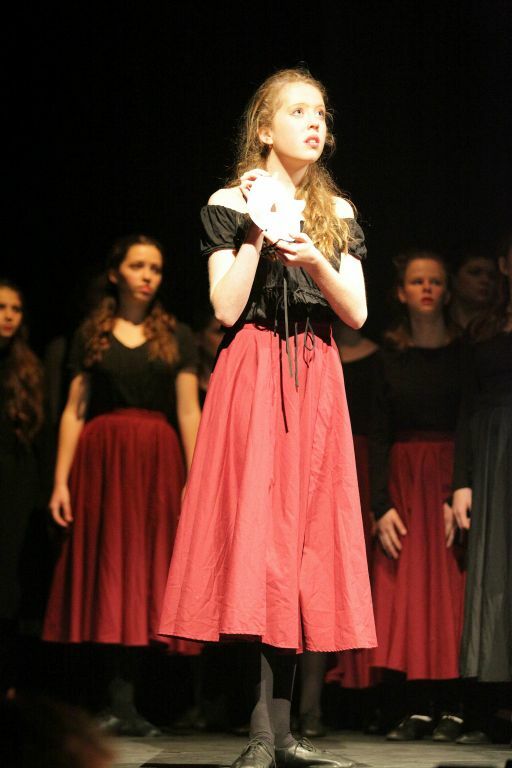 For this performance, Issy Bright played the part of Christine; a beautiful voice, clear and true, achieving those high notes demanded with apparent ease - a truly amazing performance. Well done! Euan Wilson, as Raoul, Christine's childhood friend and now her lover, was convincing in his role, as was Rebecca Sarginson, as Carlotta, the opera prima donna; another fine performance from her, well supported by Josh Terry as her husband and "not so talented" lead tenor Piangi, who meets an intimely end. The terrified management of the opera house were all well portrayed, their musical numbers "Notes" and "Notes II" very well vocalised and enjoyable: Florence Russell as Mme Firmin and Alex Holder as M. Andre, the new co-managers, trying to keep calm, and carry on through the various disasters that ensue; Jess Kambitsis as Mme Giry, the ballet mistress who knows more than she's prepared to admit about the Phantom's exploits, Jonny Gadd as the hapless stage-hand Buquet and Harvey Redfern as M. Reyer, the opera house's chief director/rehearsal master. Completing the young cast with nice cameo roles were Molly Govus, as the auctioneer in the opening scene, Rachel Wyatt as Le Fevre, the retiring owner of the opera house, Joel Cairns as soloist "Passarino" in the scene from the opera "Il Muto" and the trio of Mia Bird, Imogen Chancellor and Millie Davies, who collectively played the role of Christine's friend Meg for this production. The supporting chorus of young singers and dancers, too, added significantly to the performance. The set, though simple, together with a good lighting plot, was very effective in creating the magical and ghostly atmosphere, the subterranean "lake" scene particularly dramatic. With cleverly designed props, authentic and colourful costumes, delightful choreography and the well-balanced and supportive accompaniment from the musicians, under the baton of Martyn Grisdale, this was another triumph for this young and very talented group.